As you probably noticed, the number of posts on Talk-a-Vino is down very significantly. There are many reasons for that – different workload from my day time job, few time consuming projects we tackle at home, and of course the plain familiar writer’s block. Yep, the writer’s block – when there is lots running in your head, and you have a great difficulty to put something out on the “paper”. 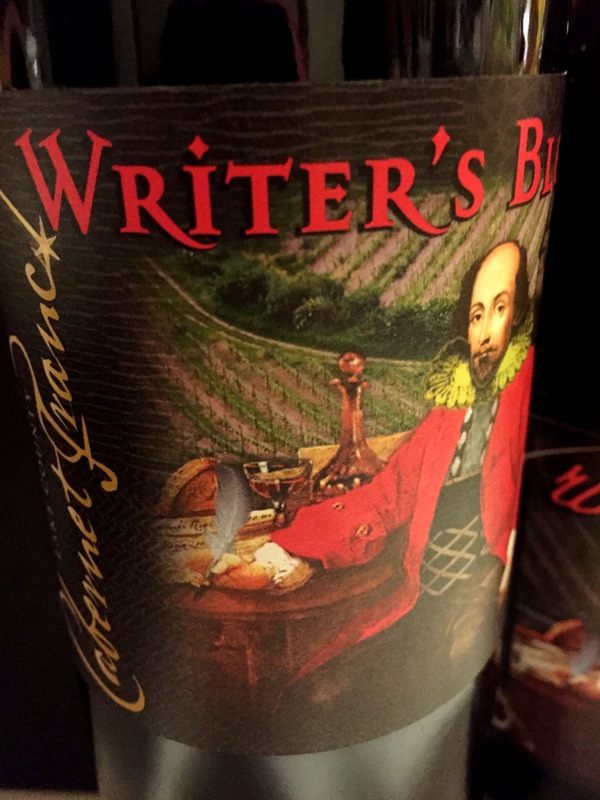 I tried to address the last one using the wine, I would hope specially made for such an occasion – the wine called Writer’s Block and made by Steele Wines in California. I first saw this wine mentioned in the blog I follow, called Mrsugarbears, and as you might see in my comment to that post, “Must. Find. This. Wine” was the first thing I said. I found the wine, and I got the Cabernet Franc and Grenache to try, out of the vast variety of the wines under that “Writer’s Block” label (you can see the full line of wines here). Let’s get back to that Friday. In the morning, the shipment of Horsepower Syrah arrived. I’m not sure how I managed to get on the list for this first release of super-highly allocated wine – but somehow I did, back in May. The wines comes from the legendary Christophe Baron (Cayuse, No Girls), from the tiny vineyards in Walla Walla Valley, all farmed sustainably and biodynamically (here you can read more about Horsepower Vineyards). Okay, so it is all great, but not my main point here. I got a shipping notice from UPS at the beginning of the week, and then I got shipping delay notice from UPS, saying that the wine would be delivered only on Monday, which would be a problem as I’m traveling again next week, and there would be good chance that nobody would be able to sign for the wine during the day. This is why the delivery on Friday was so exciting that I even decided to share it in this post. This was also the first wine I received wine in the nice wooden box – so here are some pictures for you. The next event on Friday was a really a double pleasure. At the beginning of the week, I connected to the @TheVineWineClub on Twitter, and then I got a note about possibly joining a radio talk show about the wine. Really? Yes, I can talk wine, I actually love to talk wine, so I said that I will be glad to do it – and it instantly happened, right on that Friday. At 3 PM, I was a guest at the regular radio talk show called “Off the Vine Radio Show with Benita and Terricinia“, hosted as you can tell from the name, by Benita and Terricinia. The theme was about the sparkling wines, so to support the conversation I decided to open a sample which I recently got – Ferrari Perlé from Trento in Italy. I almost feel guilty talking about Ferrari wine just matter-of-factly – the winery was founded by the Guido Ferrari in 1902; he was responsible for bringing Chardonnay grape into Italy, and he can be pretty much considered a father of Italian Méthode Champenoise wine industry. Full range of Ferrari sparkling wines is nothing short of spectacular and again, it really deserves it own coverage in a separate blog post. And the radio show – it was fun all the way! Benita and Terricinia were great hosts, very knowledgeable about the wine, so we definitely had a fun conversation (I really hope I didn’t overstepped my boundaries by talking to much)! I’m not going to recite our conversation here, but if you got a bit of time, here is the link for you for the broadcast. And if you will actually listen to the program – let me know (honestly!) what you think. And the last highlight of the day – Port and Madeira tasting! Graham’s Six Grapes Old Vines Port ($34.99) – young and aggressive. Needs some time to mellow down – it has a sharpness of young fruit which still needs some polishing when it comes to the Port wine. After a bit of the breathing time, will perfectly finish a meal. 2011 Graham’s Vintage Port ($75.99) – again, this is the port from the amazing vintage, so it needs a lot of time to develop. Young bright fruit, blueberries and blackberries, firm and powerful body, excellent balance. Give it a 20 years, it will show what it is capable of. Graham’s 10 Years Old Tawny ($27.99) – delicious. Dried fruit all over – figs, apricots, touch of hazelnut. And I love the bottle’s look and feel – this is a new packaging for this port which I think makes the wine shine even more. Graham’s 20 Years Old Tawny ($45.99 – great price!) – make it double delicious. More dried fruit, nuttiness all the way, extremely complex. Thought provoking and might make you forget all the world troubles if you will be left alone with the bottle. My favorite from the tasting. Last but not least – Blandy’s Malmsey 10 Years old Madeira ($23.99 – an amazing QPR) – a bit of sweet fruit on the palate, lots of complexity between nutty and salty profiles – delicious all the way. Here we are, my friends – one eventful Friday. Writer’s blog, be bone – I can’t deal with you. Cheers and have a great week ahead! Thank you for mentioning me 😍. Happy holidays! My pleasure! Thank you for the pointer to the Writer’s block wines – there lots of them to explore. Happy Holidays to you and yours as well! You may have writer’s block, but this is a great post with great photos. 🙂 Cheers! Love the Ferrari Perle. Give yourself a break on the block. You consistently share do much good info and insight. Enjoy the holidays and you’ll find inspiration in time! Totally get that! When I can’t find a sufficient angle I go brief and compile or find a common thread and touch on that. Good luck! Vino Volo Experience – Mostly a Rant #MWWC13 Final Reminder!